When do Babies Crawl ? The birth of the little one is indeed of the happiest and landmark moments in every couple’s life. Each and every phase of the growth of your baby is an event in its own way and these are the most joyous moments of your life. Crawling is one of those special moments that mark the independence of your baby. The age babies’ crawl is not defined and varies from one another. In this article, we will talk about when do babies crawl and how crawling develops. MYTH BUSTED: CRAWLING HAS NOTHING TO DO WITH BABY’S HEALTH! A lot of parent’s get worried if their baby starts crawling at a later age. Crawling is just a sign of independence and efficiency of a baby and varies from one baby to another. It is just another sign of strengthening of the baby’s muscles and next stage of the baby’s growing cycle. There is no set age or time for a baby to crawl. It depends on the body of the child and how the bones and muscle are structuring themselves. According to a survey conducted recently, 80% of babies start crawling between the age of 6-10 months, while 12% start crawling at 5 months and only few, i.e. 8% of the babies start crawling between 4-5 months. The last lot is very rare and these babies are categorized as over-active babies. As soon as you start noticing that your baby is getting hyper active and moving more than ever before, trying to get down from the bed or loitering around over the pillows, you must know that the baby’s crawling period has come! In very rare cases, some babies skip the crawling phase and directly start taking support and standing. Do not get hassled if your baby is one from this lot as this has nothing to do with the baby’s health. Crawling is the first sign of natural motion in the baby’s body and the first ever locomotive step in his/her life. This style is a display of the strength is the baby’s arms and legs. The baby simply crawls by keeping the arms and legs straight, something which only a bear does! A very happening style indeed, the baby crawl with the support of the belly, much like a seal does. This implies that the baby’s body is still in the process of developing strength in his arms. It sounds very funny, but this is actually another style of crawling in babies. In this style, the baby sits up straight and tries to move forward rubbing his hips against the floor. If your baby is crawling using a single hand, it means that he/she is in the process of learning how to balance their body. This not only marks the development of the baby’s muscles and bones but also the brain which is learning how to balance the body. Crawling is a milestone in the baby’s development cycle and marks the beginning of the growth of the baby. Once your baby learns how to sit, he will soon make the first move and start crawling. You will be awe struck at the sight which is completely unpredictable as there are no set signs or signals that will tell you that your baby is about to start crawling. When do babies crawl and sit up is a very exciting topic for study and till date, doctors or scientists have not been able to arrive on a particular age or time. 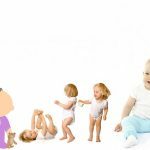 After the babies completes the crawling period or the crawling cycle, their arms and legs become strong as the muscles develop and they now know how to balance their body. Soon after this stage is complete, the babies are ready to take the next step and start trying to get up and stand using support. From lying on the bed, rolling from one place to another, crawling for days together and finally learning how to stand, the baby’s development cycle is a big event in itself. Each stage has its own share of memories and is the best phase of parent’s life and something which they will harness till the time they are alive. This is it from our side on how and When do babies crawl, how they crawl and what crawling is all about! For more information on different aspects of a baby, before and after birth, keep checking out this space. Do let us know if you wish to know about something apart from whatever is mentioned in the article above. We will be more than happy give you a hand in this amazing journey of parenthood. «Next Post How To Get A Baby To Sleep ?